CG method- what to do between co-washes? Ok, so I'm trying the CG method again. I tried before but I don't think I totally understood what to do. 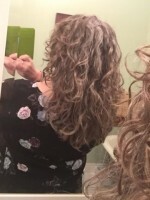 No-poo has worked for me in the past, but I'm a little confused about one part of CG method. It suggests co-washing once a week (which I believe will work well for me) but what do you do between co-washes? Do you keep your hair dry? Do you wet it without any product? Do you condition the ends? Do you apply gel? Help! Also, I take a shower every night. What should I do overnight to help min my curls? I have 3A curls, thin (low density), low porosity, medium thickness. 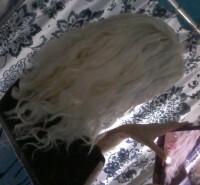 My hair tends to fall flat and get weighed down easily. I don't do anything between washing and cowashing. I don't get my hair wet at all. Whether you add products or not will depend on your hair. If you need products, you can use them or it you need water to refresh, you can. There isn't quite a set "do this, not that." I think the official cg method says to spray a conditioner water mix on frizzy curls and do a pin curl. To keep curls overnight and fight flatness, pull your hair into a pineapple on top of your head. That should help preserve volume at the roots. Best of luck! You don't need to wait a full week to co-wash. You can cleanse your hair as often as you like. There's a lot of misinformation floating around (even the articles here). But if you read the Curl Girl Handbook, no where does she say you have to wait a week to wash your hair. I wash my hair almost daily, but most people seem to wash 2-3 times a week. Do what works for you.